Sandy, our instructor for this Seminar, holds a B.A from Frostburg State University, MD. She has 25 years design experience and works as a Graphic Designer for an international nonprofit. She also serves as president and founder of Operation Write Home! Welcome to our second seminar in this design series! These seminars are intended to help cardmakers at all levels grow in their craft, get new ideas, and take each one of us to the next level of creativity! 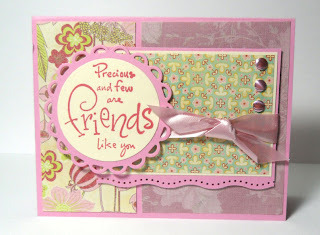 At the end of the text/photo section of this seminar is the ustream class - that includes many more card samples and a discussion of ribbons and bows, so be sure to check it out! “Creativity often consists of merely turning up what is already there. Texture and dimension are an area of much confusion for many of our cardmakers; our guidelines state that lumpy cards are okay, as long as they're not too lumpy. So what the heck does that mean? 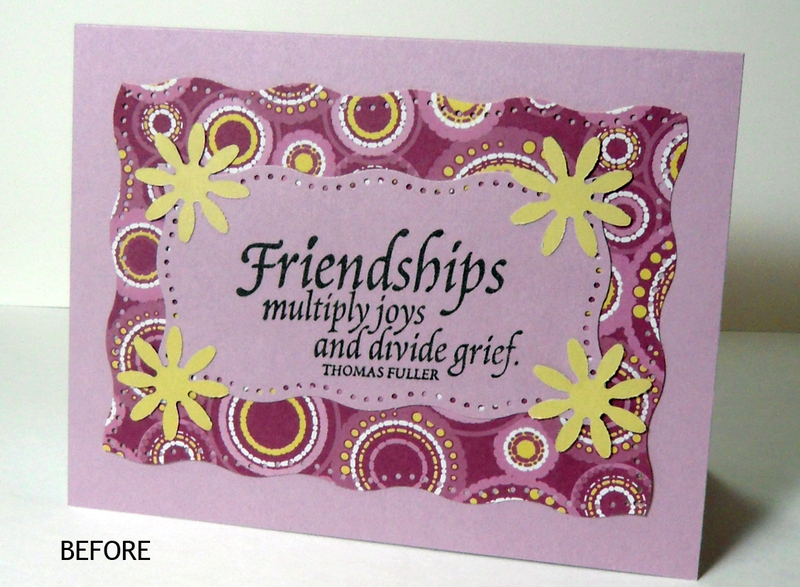 We recommend using the thinnest you can find, especially if you desire more than one layer of dimension on a card. You can see the comparison below between the Scotch adhesive, with the green backing, and the squares - these create a vast difference in the amount of depth on a card. What's TOO much dimension? How thick is too thick? For our boxes, completely flat cards fit the most into each box. While that's great, it's not completely our goal: we do want these cards to be beautiful, eye-catching, and we want our heroes to be excited to look at them, touch them, and write lovely sentiments in them. All-flat cards would become boring after a while! So a mix of various types is our goal. Dimensional layers: Please don't stack layer upon layer of popped items one on top of another. A "tower" of dimensional elements causes envelopes to be jammed in postal machines, and we need these important letters to make it home to loved ones intact! If you use the thin scotch mounting tape, you may get away with two layers, but please read #4 as well. Buttons: Thin shirt-style buttons are fine, but thick buttons, most especially the big vintage ones, are our biggest offender. Our shippers often put these in the hospital to remove thick buttons and replace them with thinner buttons from their own stash. Buttons on thick-layered-flowers can also be a problem. 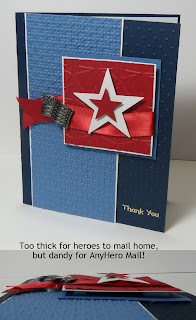 Thick embellishments: There are brads, flowers, and other items that are along the same depth as vintage buttons; please limit their use to AnyHero cards. Even some of the 3d stickers, made for cards, have 5 or 6 dimensional layers that are a real problem for postal machines! Balance! The post office tells us, of course, never to have a bump on a card. Officially. 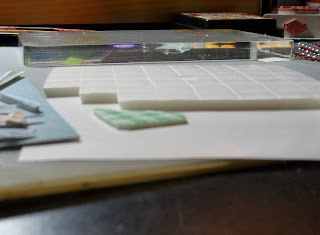 However, some who know those machines have said that an EVEN amount of dimension works better than a totally thin card with one giant "bump" of an embellishment. If you start putting dimension behind elements on one half of a card, balance it out with layers and embellishments on the other side; this creates an envelope that feels "thick and flat" - and that stands a much better chance at going through a postal machine than something with one item stabbing through the envelope. See the video for more description of this. 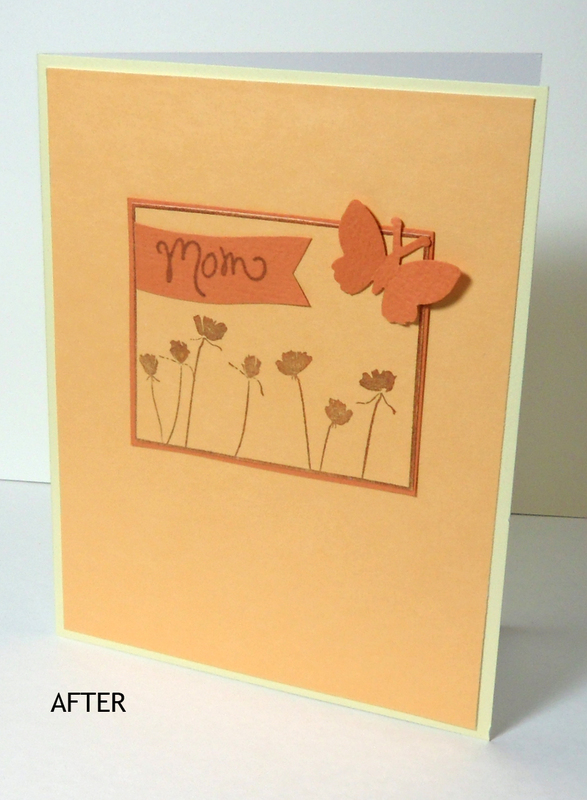 Texture and dimension on a card is a great opportunity to make elements of the design really "sing" - let's start with looking at this simple card, stamped on one layer of cardstock, with a punched butterfly added. While this is fine, a few small changes could really make a big difference. 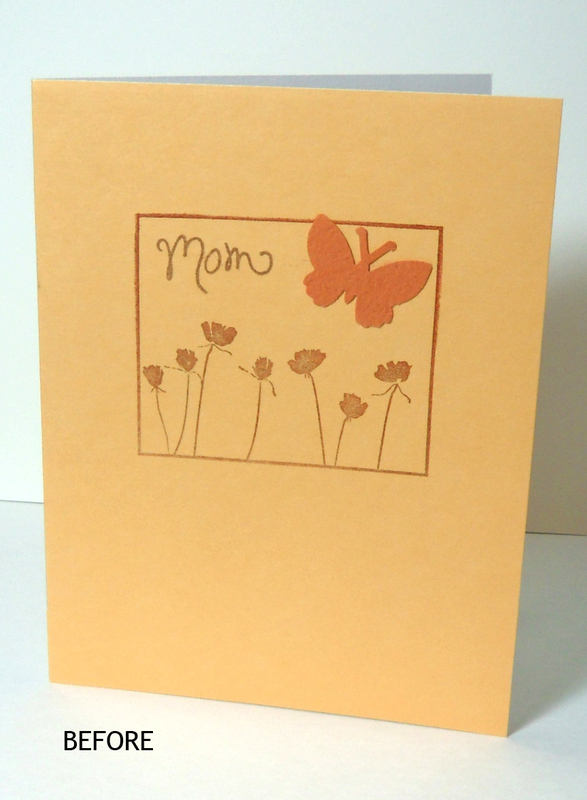 This time the card front was done on a separate layer, and adhered to the card base of a slightly lighter color. 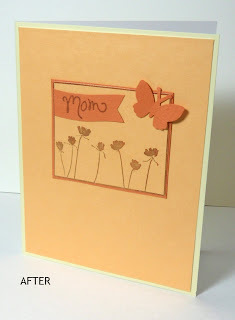 The image was trimmed out and layered on the orange coordinating cardstock to give it just a little extra dimension, and the sentiment was stamped onto a banner to draw more attention to it. The butterfly is now attached with a very tiny glue dot and attached on the corner, which now makes it look more dimensional, without even adding thick dimensional adhesives beneath it. This card needs some help! 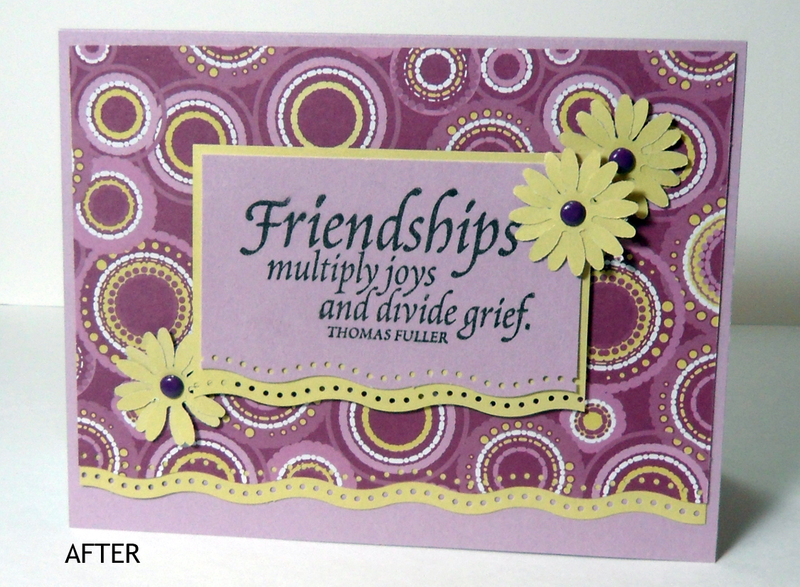 The background paper and sentiment were cut out on all sides with a border punch (could also have been with a pair of decorative-edge scissors) - which adds more visual detail than needed with the design. Flowers are added on the corners, and get lost on the busy pattern. The revised card at right simplifies the edges - most are now cut straight, which allows the one side of each paper to get more attention. Coordinating yellow layers begin to draw the colors of the entire card together, and the layers begin to define the separations between the patterns - making it much easier to see what's on the card. The flowers are duplicated, two punched flowers and a brad for each, and are gathered in two corners only - a trick learned from our Focal Point Seminar 2 months ago! 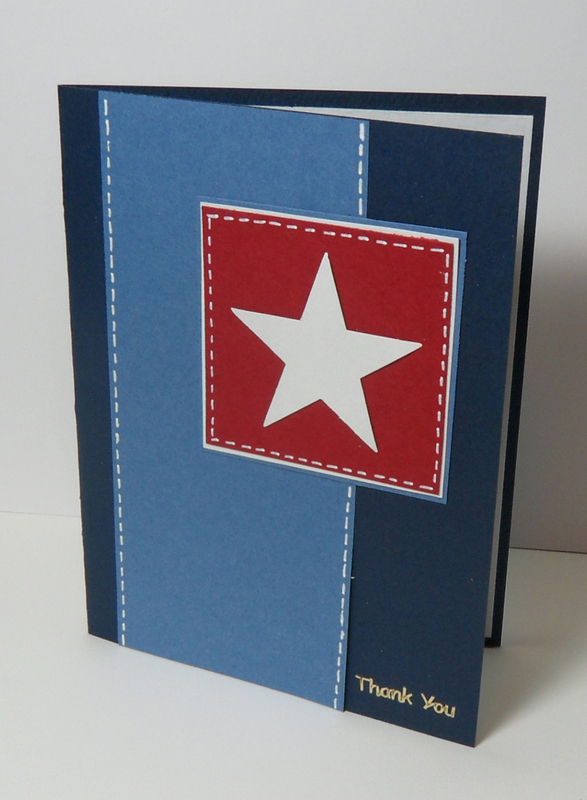 This star card, based on Sketch #2, is clean and simple. 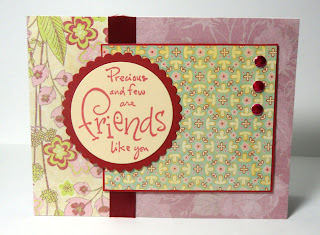 Layers of cardstock create a strong, clear design, and hand-drawn stitching adds detail to the edges of the sections. There's nothing at all wrong with it, and yet....it has such potential! In this version, the white/red star section is raised up on dimensional adhesive, and both the white and red stars are popped too. 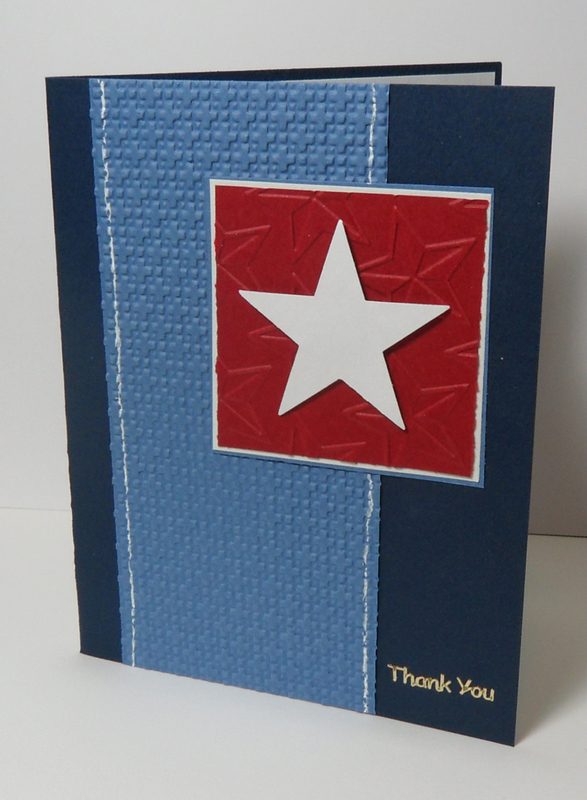 The card base has been embossed, a white layer behind the blue strip, and a larger blue layer behind the star section. A ribbon and thick flag brad are added to create even more bulk - and oops! We went just a bit too far! This card would be way too thick for our heroes to mail back home; the multiple layers behind that star are a little over the top. 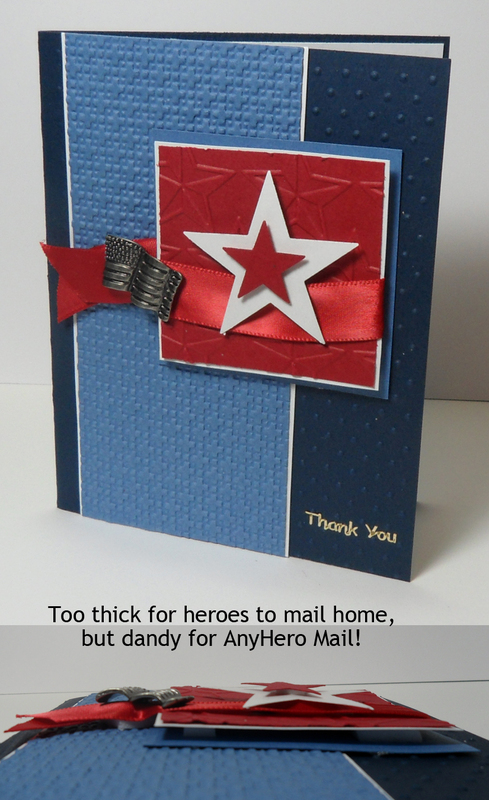 Fortunately, this is still perfectly suitable for an AnyHero card - those can be as thick as we want, since they go in the box and not through postal machines! 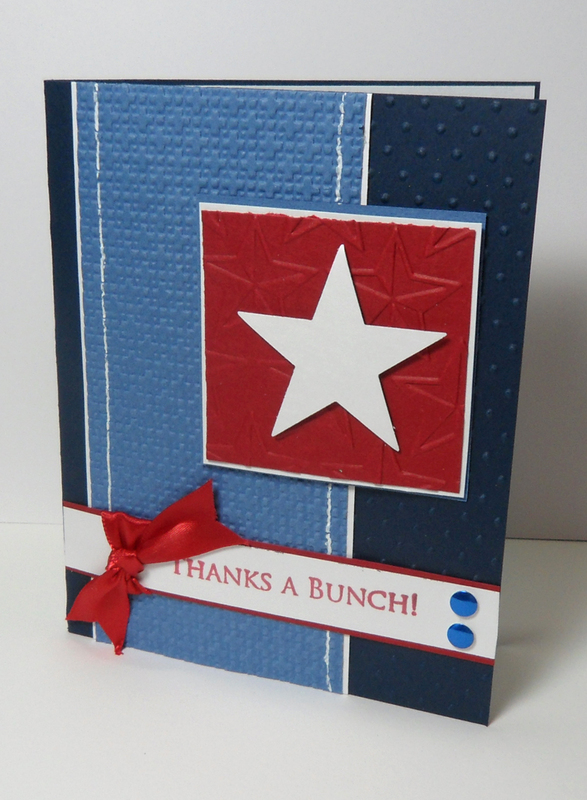 This card shows more balance; the star is still popped with the thin dimensional adhesive, and there is still dimension behind the white square in that section - but that leaves it with only 2 pieces of stacked dimensional adhesive - this would be about the max we'd recommend. The star section on this card is balanced with the sentiment embellishment below - 2 simple layers of cardstock and a small knot of ribbon. This will make the entire card, within its envelope, be more 'evenly' thick - causing less postal troubles. 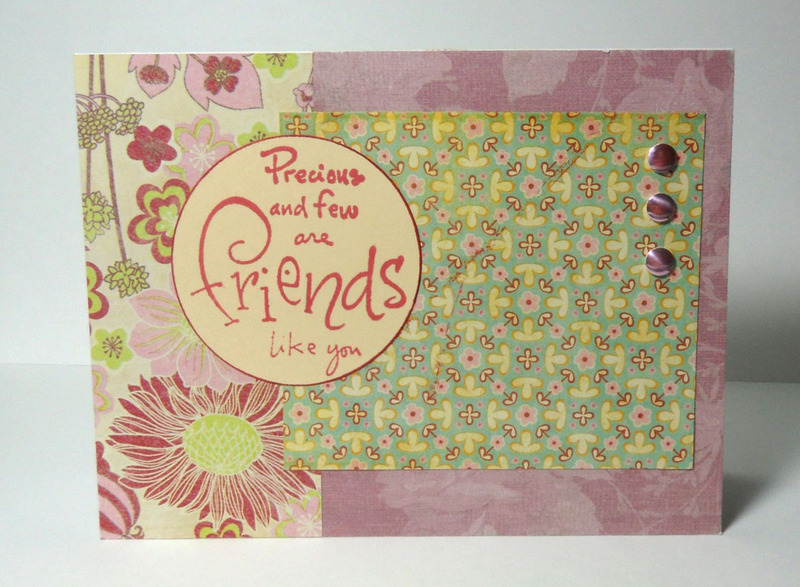 This friend card, based on S&S Sketch #36, will show us how visual texture works on a card - along with dimension. The three papers here share some colors in common (chosen from a pack of coordinating papers), the sentiment circle is edged with ink. The design is fine....but it lacks some 'zing.' This has much potential for being a card that would really pop! First, divisions were created between each paper section - no dimensionals were added, aside from paper and ribbon. A scallop now surrounds the sentiment, drawing attention to it; a strip of ribbon was glued vertically to separate the background papers; and a layer of cardstock was added beneath the green paper to separate it visually from the papers behind it. The three adhesive dots were colored with red Copic marker, to make them coordinate better with the stronger elements on the card. And then...even further changes start making the card even better. The background papers were trimmed a little smaller, and the card base was changed to red. 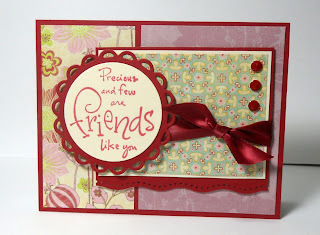 Two layers now surround the green paper - cream to coordinate with the sentiment, and red to match the card base. 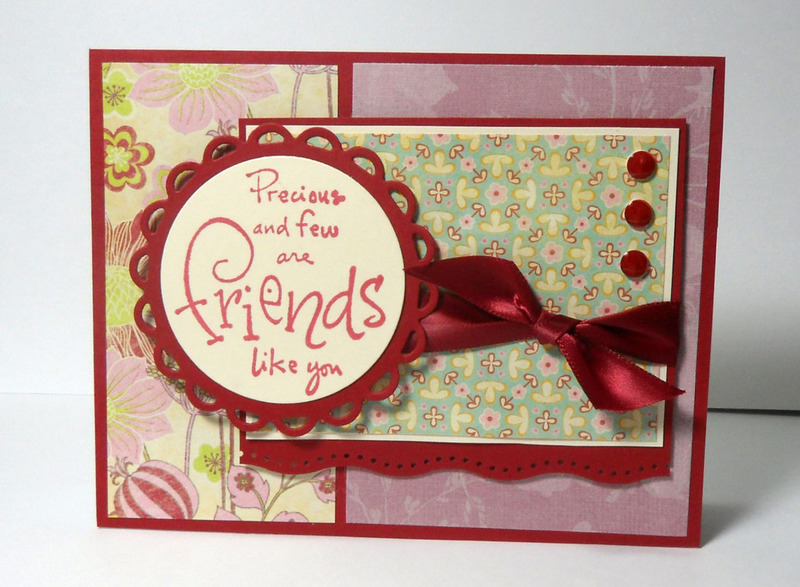 The red layer also has extra hanging off the bottom, which was enhanced with a border punch, to further soften the card. The sentiment is now on an even fancier scallop, and that section is popped on the thin mounting tape (dimensional adhesive). Ribbon was tied onto the green section prior to adhering it to the card. Here is the same card, with simply a color change from red to pink - it has a similar wow factor but with a different feel to it because of the color. More card samples are shown in the video below, as well as a discussion of ribbons and bows - including a tip for tying - so be sure to check it out! Great post Sandy. Lots of good tips. I wish my connection was good enough to watch OWHtv but I'm glad your also posting the videos and hoping I'll have some luck with them. This was very helpful to me. I am working on a box of cards now, and see that some have to go back.. under the knife, lol... and get a little reduction surgery! Better here then in the hands of the shippers! Thank you so much, the last thing I want to do is add work for the shippers.